Although the sound of fine crystal glasses clinking may be lovely and could dissipate evil spirits, it is bad news for glassware and your host. It could be unsafe and expensive when the two "toasters" knock too hard; glasses could crack or break. In just a few hours, you will be saying goodbye to 2014 and welcoming 2015. You know how the song goes, but do you know how to toast? 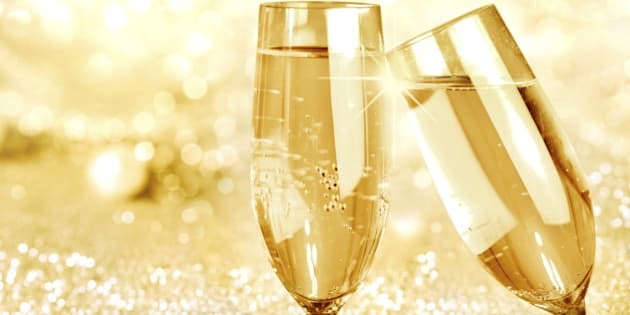 Here is your New Year's Eve toasting guide: origins, dos and don'ts. The origins of toasting are attributed to a 17th-century Roman practice. When serving cheaper wines, a burnt piece of "toast" was placed at the bottom of the glasses. It absorbed the undesirable flavours to decrease the wine's acidity. Clinking glasses prior to drinking are associated with medieval poisoning rituals. Conquerors purposely knocked each other's glasses hard enough to make the wines spill over into their opposite's glass. Suspicious glances would exchange to validate the other's intentions. If the other merrily took a sip, you knew that you had not been poisoned. 2. To clink or not to clink? For a New Year's Eve celebration, where you are celebrating with friends, not foes, there is no need to clink. All present have intentions of peace. For your host's sake, don't bang. The host should always offer the first toast. Prepare ahead. Your goal is for a toast that focuses on the occasion, is simple, brief and from your heart. Feel free to get inspiration from this famous JFK Remark at a dinner honouring the Nobel Prize Winners of the Western Hemisphere. "I want to tell you how welcome you are to the White House. I think this is the most extraordinary collection of talent, of human knowledge, that has ever been gathered together at the White House, with the possible exception of when Thomas Jefferson dined alone." Make sure that all your guests have something to toast with. Sticky situation: Some of my guests do not drink alcohol. Do I still serve them bubbly? Solution(s): No. Although many hosts serve the traditional toasting nectar, it is perfectly acceptable to usher in the new year with a non-alcoholic drink such as pop, juice, sparkling or flat water. This ceremonial toast is about conviviality and celebration, not the beverage. If you are planning on serving champagne, try this entertaining tip from our Huffington Post France friends by sabering it with a glass. Love the whimsical sounds and pop! Gather your guests and get their attention. Do not whistle or use silverware to tap on your glass. It is tacky. If you are hosting a large group, get the support of a few friends ahead of time. Ask them to go in the corners of the room. Tell them that when you will go to the front of the room, that they should direct others in your direction. Start with "Ladies and gentlemen, may I please have your attention." If the conversation is still lively, repeat and louder. When you have everyone's attention, make your toast. •	Hold your glass in your right hand. •	Hold it by the stem. Do not cuddle the bowl. If your fingers are soiled from finger foods; it could dirty your glass, change its smell and alter the temperature of the wine. •	Raise your glass between your shoulders and your eyebrow. •	Bring your glass towards the center of the group; standing throughout a crowded dance floor or sitting around an intimate table feast. •	Smile and make individual eye contact with as many people as possible. •	Respond with the host's expression: "Cheers! ", "To 2015", "Here's to the new year!" What is your favourite expression? I'd love to know, write to me julie @etiquettejulie com. •	Take a sip and enjoy the moment. Sticky situation: I am being honoured, toasted by my host. Do I drink? Solution(s): No. You do not drink to yourself, just like you do not applaud yourself. Simply smile, make eye contact with the guests and say "Thank you." A "thank you" toast is usually made by a guest, towards the end of the celebration, at dessert time. For a New Year's Eve celebration, when the end time may be unpredictable, it is acceptable for a guest to propose a toast to his host, right after he has made his welcoming or celebratory speech. Want to find our more about New Year's Eve Party Guide? Read this blog post. Happy New Year! May all your dreams come true. You have a sticky situation at work or at home? This is your forum. Write to Julie and she will reply promptly. Want more solutions to sticky situations? Go to Facebook, Twitter or order your autographed copy of Etiquette: Confidence & Credibility. Planning a conference? Julie happily travels coast to coast and beyond, to present customized activities. With Julie's help gone will be awkwardness, embarrassment and faux-pas.